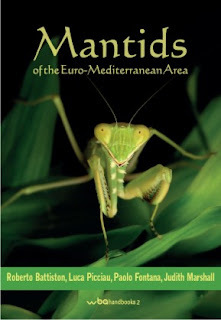 Just a brief post to announce that my Natural History Museum and Phasmid Study Group colleague Judith Marshall has co-authored this new book on the Praying Mantids of Europe and the Mediterranean. I have a copy and while I haven't had the time to get beyond the introductory chapters it is excellent (and lavishly illustrated with line drawings and photographs). A must for anybody with a serious interest in this enigmatic order.